As modern architects envisioned, the structure of an object should primarily be based upon its intended function. Therefore, Piet Kaempfer and Ralf Dietze, aka Protonica, the architects of this creation decided that each brick, each curve and angle should be built with a lot of thought, love and devotion. Every piece of sound you will hear vibrating through your ear canals has been specially designed from scratch and was tested under the highest levels of professionals. Thus, Form Follows Function is not like most albums which gets produced and released for the sake of being released, it is exactly the opposite intention ­ to deviate from the factory like music that surrounds us and craft a form that was thoroughly thought of before, while and after it was conceived. Form Follows Function is divided into 9 different functions, which were modeled into 9 different forms that will suit its desired function. However, the function is exible and dynamic, and enables each person that listens to the album to adjust his own pre xed functions and slide into a liquid amorphous ever changing entity. 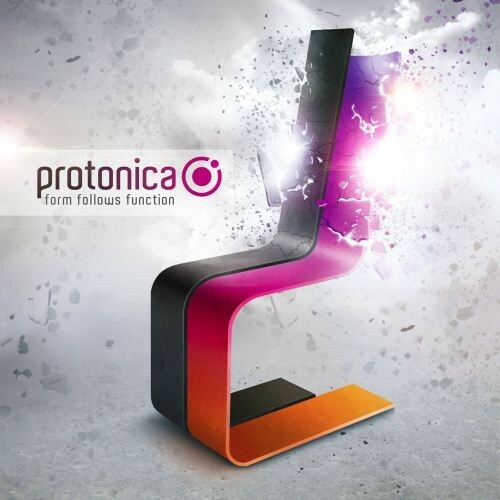 This album is the second masterpiece from Protonica,which comes 5 years after their debut album Search which was released in 2007. Now it seems that the search for their own style is finished, and the time to dive deep and explore the next stages of their sound has come. After 5 years of re ning and crystalizing their sound, they preserved their old Acid in uences, while combining new elements of Progressive and Psychedelic Trance. Dietze andKaempfer followed the function of their name - Protonica - which means positive charge, and always had the dance floor in mind in order to tell hypnotizing stories which will enchant every person. The guys have collaborated with other superb artists such as Liquid Soul, aka Nicola Capobianco, on the track Floating Point, and another exquisite joint venture where they marked their point of view on Ace Ventura, aka Yoni Oshrat, and Rocky's, aka Roy Tilbor, track Serotonin Overdose.